Rick Wakeman, former Buggle Bruce Woolley, new age musician Clifford White and the English Chamber Choir's Guy Protheroe have teamed up for the soundtrack to a forthcoming film about the legendary Lawrence Of Arabia. Titled Lawrence After Arabia, the forthcoming movie, due out in May 2020, is described as "the last act in the T.E. Lawrence story, of the last years of the life of T.E. Lawrence. Retiring to his cottage in Dorset he hopes to escape his past but is pulled into political intrigue. While he has powerful friends, with his uncompromising manner he has made dangerous enemies. As they plot against him he dies in a tragic motorcycle accident. However, with such enemies was his untimely death an assassination and cover up by the British Secret Service? The film, which stars Brian Cox, Tom Barber Duffy and Nicole Ansari Cox, is being directed by Mark J.T. 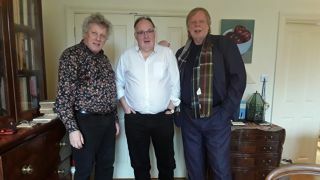 Griffin (pictured above with Protheroe and Wakeman) is currently in post production. Wakeman and Protheroe will be producing a new version of the hymn Aberystwyth. Bruce Woolley, who co-wrote Video Killed The Radio Star while a member of Buggles with Trevor Horn and Geoff Downes, is acting as musical consultant and writing a new song, After Arabia, especially for the movie. Meanwhile White is creating the soundtrack with griffin, said to be in the symphonic prog style of Wakeman, Vangelis and Jean-MIchel Jarre. More information can be found at the film's website.